Last week while I was enjoying a relaxing weekend, I noticed that one network was having a marathon of one of my favorite old TV shows. So I sat back and enjoyed several original episodes of Columbo back-to-back. I’ve always enjoyed watching Columbo from an entertainment viewpoint, but I’ve also found it instructional from a selling perspective. 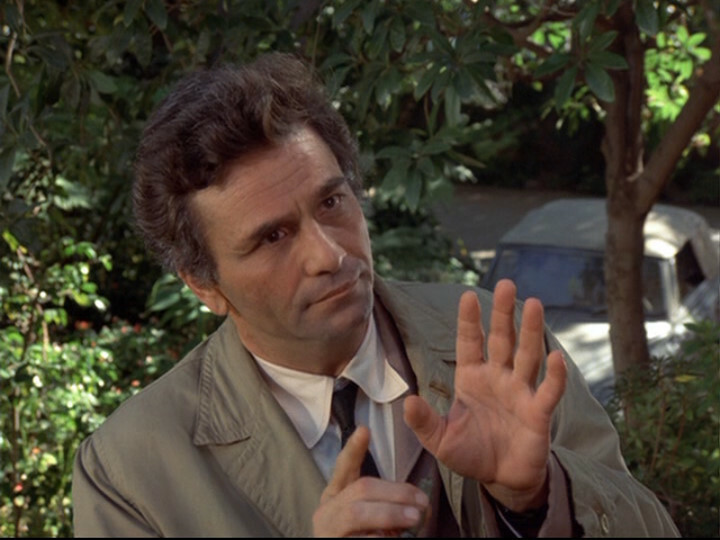 When I conduct sales training, I often use Columbo as a role model for his approach in handling people and process. I hadn’t thought about Columbo in a while but since watching part of the marathon that day, I find myself referring to him again when talking with people about sales. So today I thought I’d share the five lessons we should all learn from the master detective. He pulls up to the crime scene in a beat up 1959 Peugeot convertible wearing a rumpled raincoat. He fumbles around his pockets, pulls out crumpled paper and often mumbles his way through the discussion with suspects and witnesses. When you first meet Columbo, you will probably underestimate him. Suspects immediately feel superior and virtually laugh that such a bumbling detective has been assigned their case. But what happens next? The suspect lets their guard down and starts laying out the clues that ultimately seal their doom. I worked so hard to “show power” that I inadvertently shut my prospect down. Think about it for a minute. When you feel like you’re talking with “the salesperson” are you more or less likely to open up? While I’m not suggesting we go to the lengths of Columbo, I found that when I de-powered my approach, and initiated the conversation with just a bit less confidence I gained far more traction, much faster. Allow yourself to be underestimated and see what opportunities it opens up. When Columbo is interrogating suspects he always makes the suspect feel like they are in control, all the way through to the confession. From his masterful use of silence to get them talking, to the questions he asks and how he asks them, his ability to give the perceived power to the suspect keeps things moving. Great salespeople do the same thing. When you’re controlling the conversation, you are taking the power away from your prospect. A great salesperson understands what they’re looking for and uses a variety of techniques to allow their customer to maintain the feeling of control throughout the entire process. When watching the show, you see it about halfway in. The suspect begins to get a little concerned that maybe this bumbling detective isn’t as clueless as he may appear. What causes these concerns? It’s the questions he’s been asking. What’s fun about watching Columbo episodes multiple times is that you get to see how he crafts his questions. He doesn’t waste his questions. No matter how simple, every question he asks has a purpose to it. Every question takes the conversation deeper. Additionally, when he gains a piece of important evidence, he doesn’t do anything with it immediately. He lets it sit there while he continues to build his case. Far too often salespeople waste the limited time they have with prospects by asking ineffective, boring questions. When a prospect shares a “hot button” in response to a question, they jump on it and start over-selling before they’ve put their full sales proposition together. I never really thought of this one until my most recent viewing. This may have even taken over as the most important lesson. Columbo is always playing the long game. He realizes that just as no complex sale is made with one conversation, no crime is solved in one interrogation. At least once in every episode, Columbo cedes ground to his adversary. But the great detective realizes that he does not have to win every conversation to solve the crime, that sometimes ceding ground in the short-term puts him in a more powerful position for the long-term. I see this mistake constantly in sales situations. Salespeople are notoriously bad at playing the long game. They feel like they have to win every conversation, and as a result lose the opportunity to gain meaningful insights into how their prospect manages the decision process and what’s happening in the organization that can feed their sales proposition. I’m as impatient as the next person and I often have to fight the desire to try to close a piece of business too fast. Remember the goal is to bring home a long-term profitable sale, not to necessarily make it today. Or I may hear the prospect share some reservations or potential objections about something that we will be offering, and rather than trying to address them immediately, I position it for a follow up by either sending some blog posts and making an unexpected conversation with my prospect. When I coach sales organizations I always recommend that you create 2 – 3 “one more things” you can use to move accelerate your process. So if you’re looking for some great sales training this weekend, relax, turn on Netflix, create your own Columbo marathon and watch the master work.